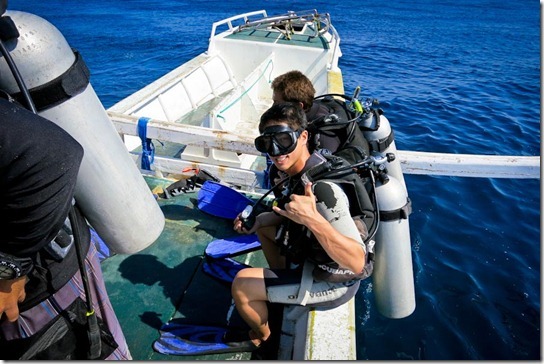 Facing our worst fears and braving the open waters with Aquaddiction Dive. First experiences are something we strive to have many of on this trip – first time bungy jumping, first time surfing. Diving was also one of them, but somehow we never got around to it – not in Australia or Thailand or Vietnam. Secretly, I think we were both scared sh!tless. Something about being in the open water, thoughts of sharks, not being able to breathe haunts me while Gerard’s fear of not being a great swimmer would be to his disadvantage. At least with snorkeling, we’re close to the surface. We said we’d give it a shot once we arrived to Indonesia, that we’d try our best to face our fears because truth is we really enjoy being in the water. 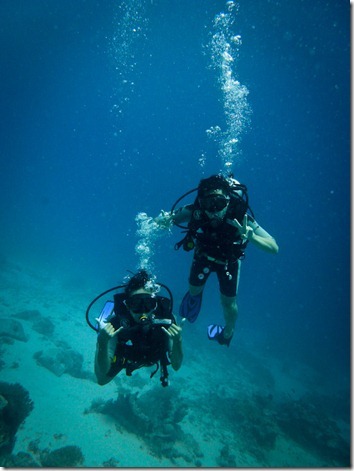 We both signed up for a Discovery Dive with Aquaddiction Dive. Our overview lesson and practice dive, where we learn the ins and outs of diving, underwater hand signals, breathing and such is very informative. It’s a lot to take in. Gaspar, our instructor is reassuring and in his smooth French accent, he puts our fears at ease. We had a practice run in the shallow waters, which I appreciated because it allowed us to get an idea of what we were getting ourselves into. I think we had our share of minor panics and at one point, I honestly didn’t think I’d be able to do it. I wasn’t comfortable breathing with the tank but after 10 minutes or so, we felt better in the water. Later that afternoon, we went out with the entire crew for our first dive. 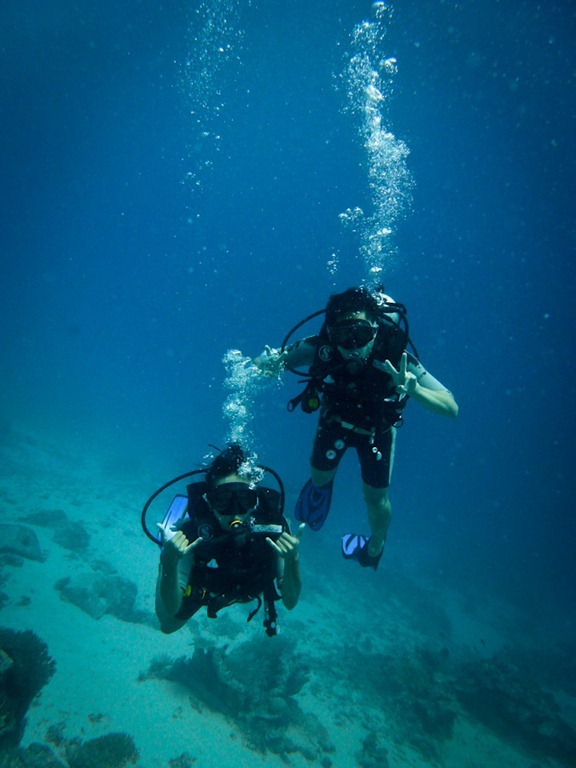 We ran into a few hiccups along the way down – my weight belt came loose, Gerard couldn’t keep his body flat under water, I couldn’t equalize my right ear. As I try and equalize on our descend, I start to panic as my worst fear decides to make a rude entrance with water getting into my mask. We’re twelve meters under water and unlike the practice run, I can’t just kick up to the surface and clear my mask. Gaspar, calm as ever, signals me to try again. And again. And again. And again. On my fifth try, I took a deep breath and gave it another go. Sigh of relief when I managed to clear my mask and Gaspar signals me the job-well-done gesture. Crisis diverted. Here’s a tip. For your first dive, don’t try and take photos. We thought we’d be able to just float freely, snapping awesome photos along the way, but frankly, with all that heavy equipment and things being so foreign – between remembering the hand signals we’ve learned, moderating our breathing and trying damn hard NOT to panic in the open water – taking photos is the last thing on your mind. Lucky for us, Gaspar held onto our camera while we were under water. Our first sighting was a green sea turtle. 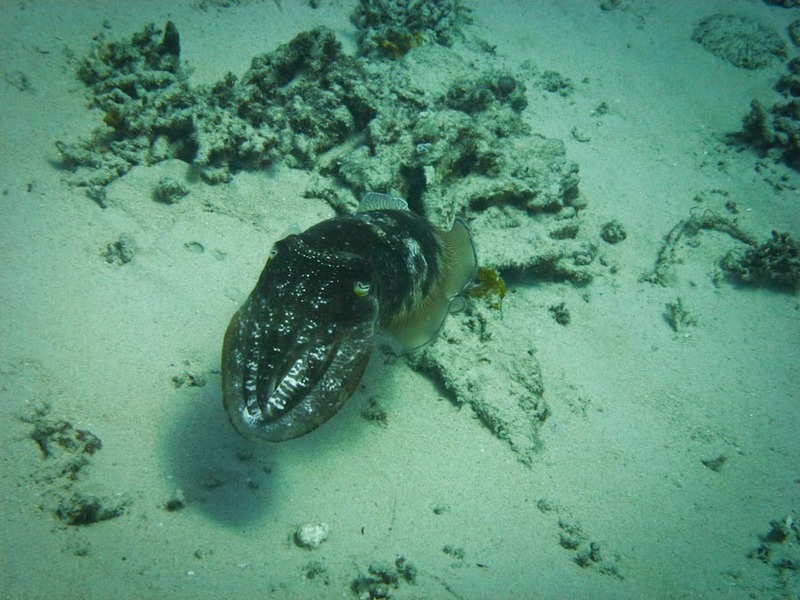 On this day, we saw two – one chilling on the sea floor and the other floating directly above us. We saw pretty iridescent purple-y coral and Nemo too. 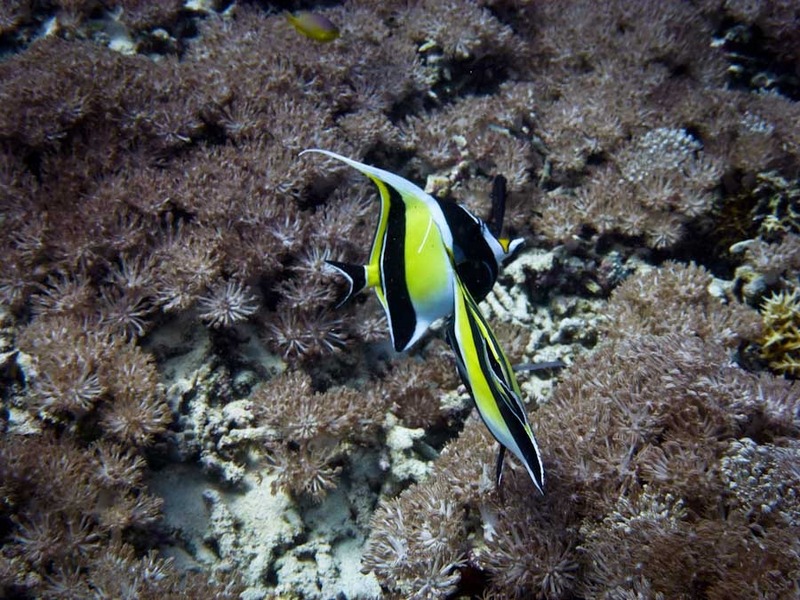 We also spotted many moorish idol fishes. I like to call them Sharkbait. After we saw our second turtle sighting on the surface, I glanced and notice a dark shadow in the near distance. My immediate thought was, Shark?! I pointed in the direction of the dark shadow and notice it had a huge wing span. It was an eagle ray! Relieved it wasn’t a shark, I was extremely excited to have encountered such a rare sighting on our first dive. No pictures from the giant eagle ray, but shortly after, we came across this ugly guy.. a cuttlefish! Once we’ve managed to get our breathing under control, all the nervousness and emotions we were feeling seem to float away. We drifted for I’m not sure how long, Gaspar tailing us, guiding us like school fishes. It was so serene, peaceful and such an out-of-body experience. Once surfaced, I managed to get out a, that was awesome!!! Why haven’t we done this sooner?! yelp to Gerard. He shrugged, gave me that giddy boyish smile like he’d just won the lottery and I knew he enjoyed it just as much as I did. Our first dive was ridiculously amazing. I couldn’t ask for a better first experience. 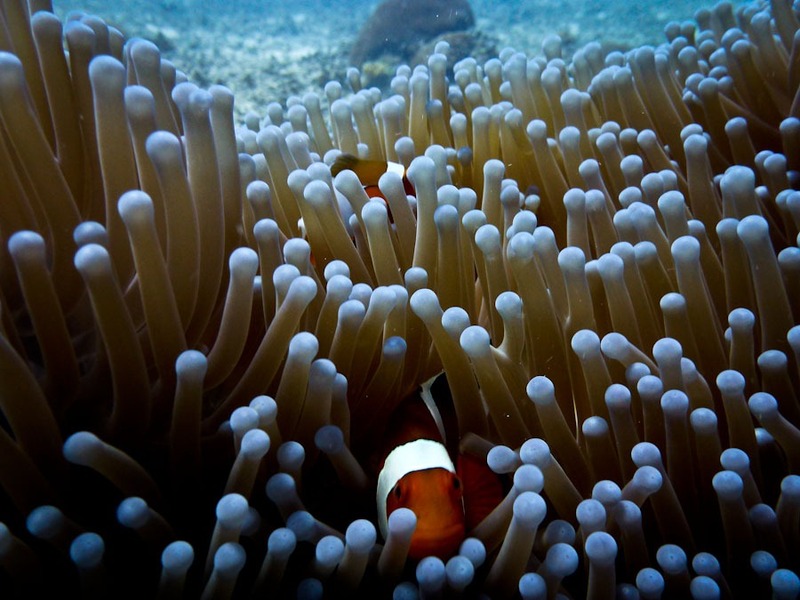 It’s one thing to snorkel near the surface, but it’s an entirely different world when you’re deep beneath the sea. Gerard loved it so much he decided to go out with Gaspar again the next day and explored a shipwreck site! I guess we both can say, fear of water = no more. Yay! What’s a fear of yours you’d like to conquer? 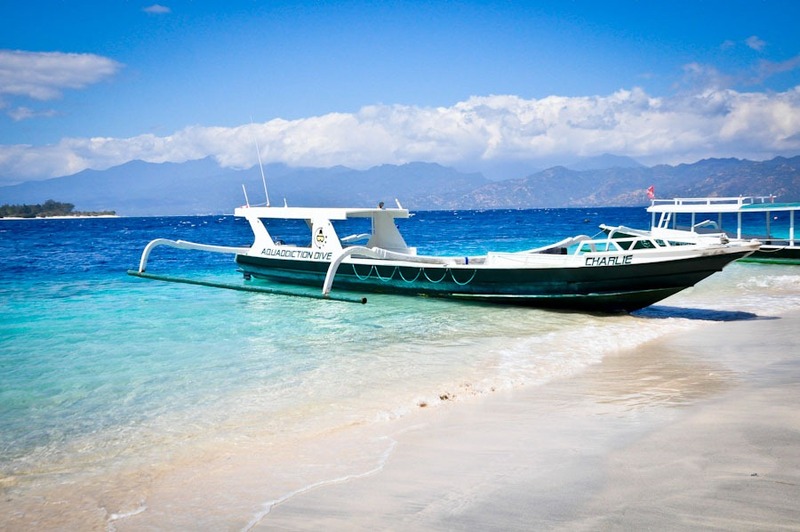 Explore the tropical island of Gili Trawangan from under water and consider diving with Aquaddiction Dive. They also offer accommodations – cute bungalows with outdoor western bathroom and fresh water, private porch, double bed, mosquito net and fan. For more information, please visit their website. 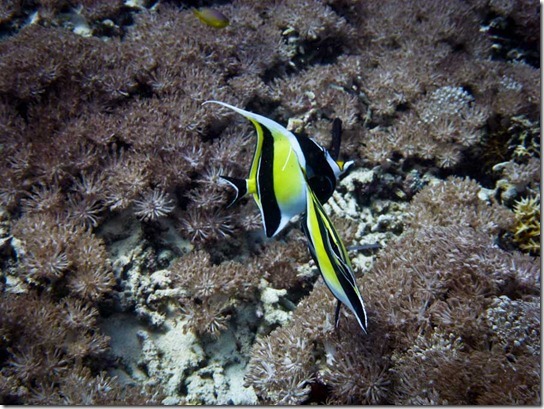 Disclaimer: We received a 2 for 1 complimentary discover dive with Aquaddiction Dive. As always, my thoughts, my words. Still my voice behind the blog. GQ trippin’ Turns 1 Year Old! Thanks! You should definitely get back out there. You guys have some awesome diving sites. Oh, crap, you guys finally did it!! I guess I have no excuse not to try it now… It seems like everybody I know is starting to dive and loving it! Haha, right?! We figured since we chickened out in Thailand.. lol. You should totally do it, Lauren. No excuses.. I was scared sh**less when I got open water certified in the Philippines. Big fear of mine too. Was there a big current over there? 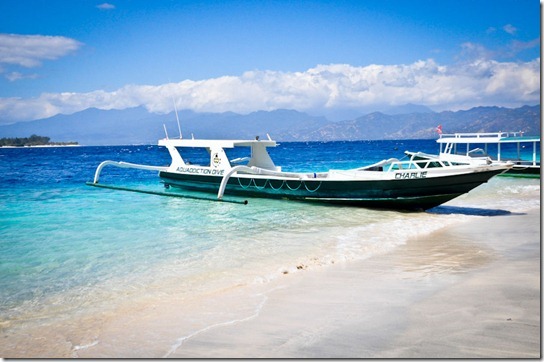 I remember when I snorkeled in the Gilis that there was a strong current. 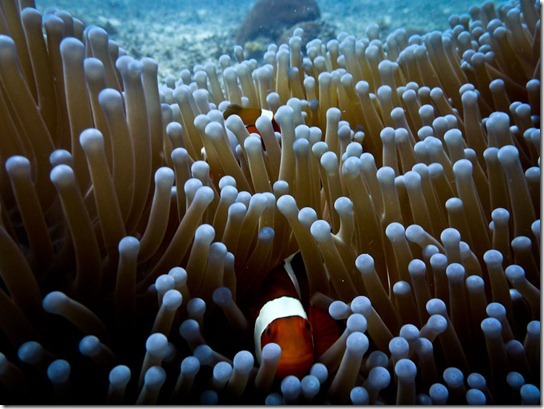 What kind of camera did you use to take underwater shots? 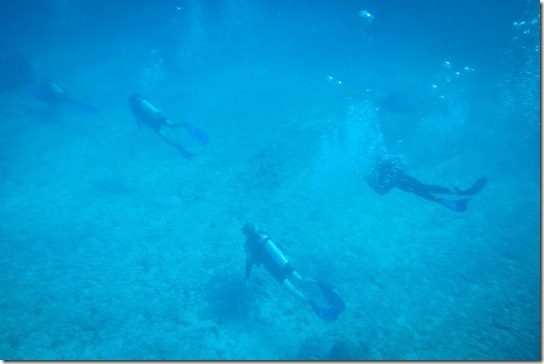 Yea there were currents – we had to be rescued when we tried snorkeling. lol. As for camera, we rented Aquaddiction’s camera with hard case and all. The pictures came out much sharper than our diCAPac case which tends to leave watermarks. Amazing! As I was reading through this you were identifying all the reasons I didn’t want to even think about doing it, but I soon realized everyone must have those fears and I am crazy not to try it. 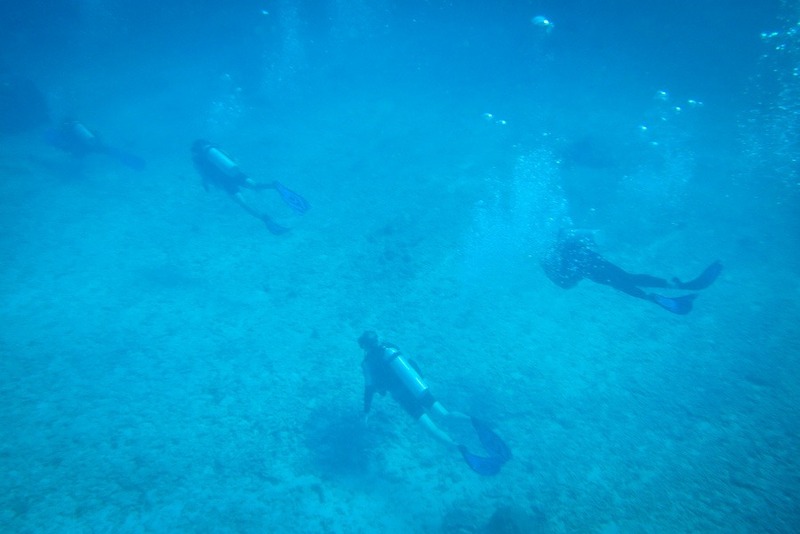 Your advanture has encouraged me put diving on my bucket list (which continues to grow I might add). This is awesomeeee! Thanks for sharing your experiences. I could read them all night long! My emotion level was all over the place on this day.. lol. But if I let my fears get in the way of experiences, I wouldn’t have been able to do half the things we did on this trip. Bungy jumping, shark cage diving.. the after feeling is so much better than the before. 🙂 Really hope you get to try this one day. Thanks for trippin’ by! Lol, you are an air creature – that’s awesome! Congrats! The whole not being able to breathe thing would freak me out for sure, but this sounds totally worth it. Diving is definitely on my list of fears to conquer! Damn I’m jealous! I’m glad you were able to push through the fear and do it! I can’t wait til I learn to dive! What an AMAZING first diving experience! 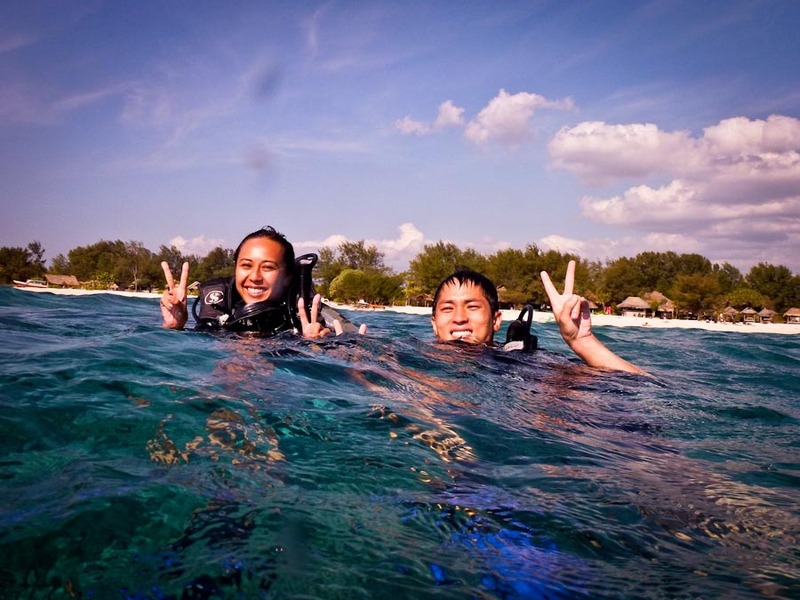 I love the water but have never dived before… it is one of the things I am determined to try once my husband and I reach South East Asia. It really does look like you are in a completely new world down there! oOo, do it in SEAsia. We regret afterwards for not trying it sooner. I hear Thailand is great for it. Let us know how it goes. Right?! I think I was more terrified at the surface. But like you, once down there, it’s so serene you forget all the fears. I really hope we get the chance to do it again soon. Definitely hooked! Amazing. So glad you guys were able to experience this. Indonesia is very high on my list! I got sick on the boat ride to my first dive. I just threw up for about an hour and then sucked it up and did the dive. I loved it! Your experience reminds me that I want to do it again, minus the whole vomiting thing. Wow.. trooper! I don’t know if I’d be able to do it if I was sick. Luckily, our boat rides were really short. Small island, I guess. Hehe. I’d love to do it again too. I have fear of grizzly bears. Would love to camp out west sometime, but the thought of a giant brown bear ripping into my tent at night puts an end to those thoughts. 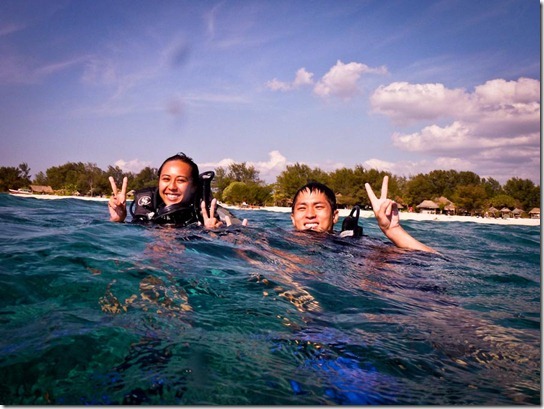 Great that you were able to overcome yours and have a great dive and take some amazing photos. Very inspiring. Thanks for sharing your fear Ted. I would just suggest try to think that most bears are like Yogi Bear. Hopefully that will help. Cheers!